Famous the world over for its university, Cambridge lays claim to having one of the highest concentrations of preserved historic buildings anywhere in England. 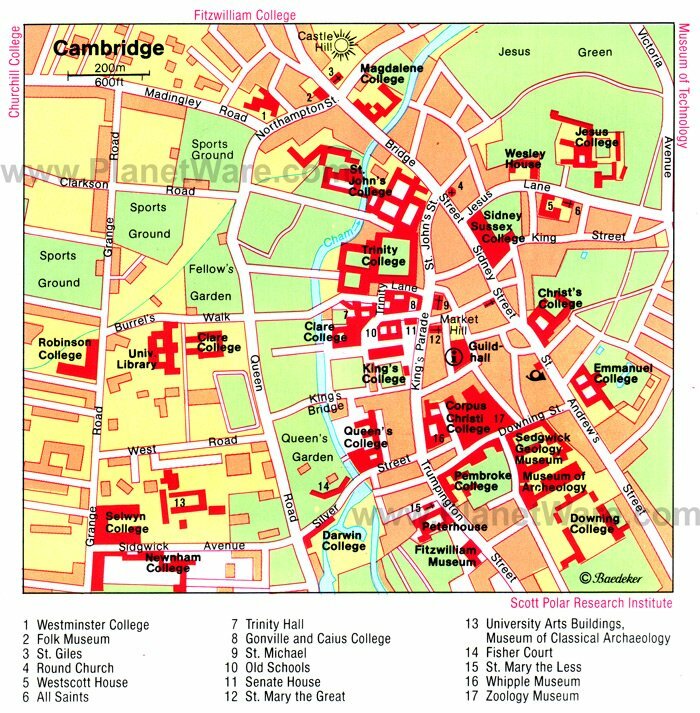 Most of this architectural splendor is centered around Cambridge University's 31 colleges, each rich in tradition. The first of these "schools" were established in the 12th century by immigrant scholars from Paris, and the first college, Peterhouse, was founded in 1284. Long before the university was founded, Cambridge was an important Norman fortification. Although its castle was short-lived (Castle Mound can still be seen near Shire Hall and affords great views over the city), the city remains to this day an important market town, and Market Hill, originally the center of Cambridge's ancient wool trade, still serves as the location of the city's busy marketplace. Despite its romantic, medieval character, Cambridge is a thoroughly modern town that hosts a variety of top-notch cultural events throughout the year, including the Midsummer Fair (800 years old and held in the same location on Midsummer Common), the famous Cambridge Folk Festival (one of the largest and longest running in Europe), and a world-class film festival. It's also popular for its numerous green spaces, including the 25-acre Parker's Piece, famous as the birthplace of modern football, and the Victorian-era Christ's Pieces, known for its lovely ornamental trees and flowerbeds. One of the most popular things to do in Cambridge is to "punt" along the River Cam, which runs through the heart of the city and offers incredible views. Founded in 1441 by Henry VI and the earliest of the royal foundations, King's College is worth visiting for the huge expanse of lawn extending down to the river and King's Bridge, with its lovely views of the Backs, the various college grounds along the riverside. Distinguished alumni includes writer Horace Walpole, poet Rupert Brooke, and economist Lord Keynes. A must-see here is King's College Chapel, renowned for its 12-bay perpendicular-style interior, as well as its breathtaking fan vaulting by John Wastell (1515). Also worth checking out: the lovely tracery on the windows and walls; the spectacular 16th-century stained glass windows; the lavishly carved 16th-century wooden organ screen and choir stalls; and the altarpiece, Rubens' Adoration of the Magi (1634). Hot Tip: If visiting during term time, be sure to attend Evensong to hear the world famous King's College Choir in action. Founded in 1448 by Andrew Dockett under the patronage of Margaret of Anjou, wife of Henry VI, Queens' College was refounded in 1465 by Elizabeth Woodville, wife of Edward IV. 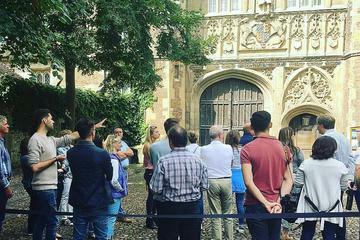 It has the most complete medieval buildings of all Cambridge's colleges, including the magnificent gateway leading to the red brick First Court, dating from the period of foundation. Other Queens' College sites to visit include the wooden Mathematical Bridge, a 1902 reconstruction leading over the Cam to the lovely college gardens (the bridge is so called because it was built without nails, relying for its strength on meticulous calculation); Cloister Court (1460) with the President's Lodge, a handsome half-timbered building; Pump Court with the Erasmus Tower above the rooms, occupied by Erasmus when he taught Greek here (1511-1514); and Walnut Tree Court (1618) and Friars Court with the Erasmus Building (1961) and Victorian chapel (1891). Covering an area of some 40 acres, the Cambridge University Botanic Garden is a must-do for gardening enthusiasts. Established in 1831, the garden showcases an impressive collection of more than 8,000 species of plants from across the globe. Be sure to spend time wandering through the garden's many glasshouses and trails, something that can be done as part of a guided tour (free on Sundays). Afterwards, be sure to visit the Garden Café and Botanic Garden Shop. St. Mary the Great is both a parish and university church. Built in the 15th century, it has a fine interior, its galleries being added in 1739 at a time when university sermons, given by great scholars, attracted huge congregations. The tower, erected in 1608, is famous for its views over Cambridge. Also worth a visit is Little St. Mary's. Known as St. Mary the Less, this Anglican parish church is famous for its many fine stained glass windows. Better known as the Round Church, the Church of the Holy Sepulchre is one of only four Norman round churches left in England. Built in 1131, its rectangular chancel was added in the 15th century. Another important church, the Gothic Revival Church of Our Lady and the English Martyrs - one of the largest Roman Catholic churches in Britain - was built in 1885 and houses a rare statue of the Virgin Mary. Established in 1546 by Henry VIII, Trinity College was created by the merger of several older colleges, including Michaelhouse and King's Hall. Beyond King Edward's Gate (1418), parts of the old King's Hall buildings are still identifiable. Trinity Great Court is the largest court in Cambridge and was laid out around 1600. A passage leads into Nevile's Court (1614), with its chapel and statues of distinguished scholars. Wren's library, with its old oak bookcases and fine lime woodcarvings, was added later. Trinity has more distinguished former members than any other college: statesmen Austen Chamberlain, Stanley Baldwin, and Nehru; poets and writers such as George Herbert and Edward Fitzgerald; philosopher Bertrand Russell; and scientist Isaac Newton. Edward VII and George VI also attended Trinity. 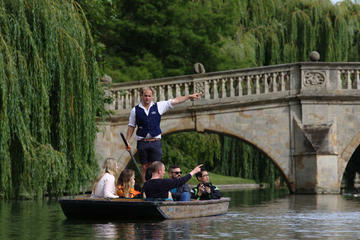 From New Court, or King's Court, take the bridge over the Cam for its beautiful view of the Backs. A magnificent avenue of limes leads to the College Grounds. The most famous museum in Cambridge, the Fitzwilliam should be included on everyone's must-see list of tourist attractions. This masterpiece of architecture contains a magnificent collection of English pottery and china, as well as Greek, Roman, and Egyptian antiquities, and illuminated manuscripts. The exceptionally fine gallery has works by Hogarth, Gainsborough, and Turner as well as Impressionists and Dutch Masters of the Baroque including Rembrandt, Van Dyck, and Rubens. Although built in the 12th century, Anglesey Abbey was refurbished in 1926 and came to be known as a house of fine art and furnishings. Now a National Trust property, this spectacular home contains numerous tapestries by the likes of Gobelin, Soho, and Anglesey, as well as an art collection featuring Constable's The Opening of Waterloo Bridge. Be sure to spend time enjoying the surrounding gardens and 114 acres of parkland, including the Wildlife Discovery Area, where younger visitors can watch birds and bugs in their natural habitats, and the Lime Tree Lookout. Afterwards, visit the historic water mill - the Lode Mill - to watch the grindstones do their job. Developed by Cambridge University in 1884, the Museum of Archaeology and Anthropology holds an important collection of prehistoric material and artifacts dealing with social anthropology. Collections have been gathered from around the world and include pieces from Africa and the Orient, with a focus on the visual and classical arts. Of particular note is the Pacific collection, taken mainly from Cook's explorations, and other research projects made by notable British anthropologists. Be sure to also visit the Sedgwick Museum of Earth Sciences which houses the university's geology collection, including some two million minerals, rocks, and fossils. Highlights include numerous meteorite specimens, as well as the Beagle Collection consisting of fossils and rocks gathered by Charles Darwin between 1831 and 1836. Also of interest is the newly refurbished University Museum of Zoology. Highlights include a large collection of scientifically important zoological material. The oldest (and also one of the smallest) of Cambridge's colleges, Peterhouse was founded in 1284. Its historic hall and storeroom on the south side of Old Court are the earliest of the original 13th-century buildings. Among those who studied here were Cardinal Beaufort, chemist Henry Cavendish, and poet Thomas Gray. Worth seeing are the stained glass windows in the chapel (imported from Munich in the 1850s) and the 17th-century altar window. Pembroke College was founded in 1347 by the Countess of Pembroke but has been greatly altered since. The chapel (1665) is famous as architect Christopher Wren's first work and was later extended in 1881. Pembroke has produced many bishops and poets, the most celebrated being Edmund Spenser (1552-99). Reformist bishop Nicholas Ridley, burned at the stake in Oxford, and statesman William Pitt also took their degrees here. Corpus Christi College was founded in 1352 "by the townspeople for the townspeople." Old Court dates back to 1377, although it has since been restored. The library contains many valuable manuscripts collected by Matthew Parker, Archbishop of Canterbury (1550), and the adjoining St. Benet's Church was the original college chapel and has a late Saxon tower. Dramatists Christopher Marlowe (1564-93) and John Fletcher (1579-1625) were notable members of the college. St. John's College was founded in 1511 by Lady Margaret Beaufort, mother of Henry VII. A richly ornamented gateway opens into First Court, a fine example of Tudor architecture. The dining hall of 1519, known simply as "The Hall," was enlarged with later buildings in 1826 and has an excellent hammerbeam roof, beautiful paneling, and some fine portraits. The Combination Room has a splendid plaster ceiling with festoons of vines. Second Court, built in 1602, is exceptionally attractive with its mellow brickwork, while Third Court includes the Library (1624). Among the many notable members of St. John's were dramatist Ben Jonson and poet William Wordsworth, who described his college rooms in his famous Prelude. Be sure to visit the exquisite Bridge of Sighs. Built in 1831, this enclosed bridge leads over the Cam into New Court and the College Grounds. One of the most popular museums in Cambridge, the Museum of Cambridge has displays and exhibits focusing on the everyday lives of the local people from the 18th to the 20th centuries. In the old White Horse Inn, the museum features an extensive collection of artifacts, including coinage, costumes, medals, toys, and medicine, along with numerous interesting artworks. Also worth visiting, the Cambridge Museum of Technology focuses on the county's industrial past. Housed in a Victorian pump house, the museum displays a working steam winch once used to haul ashes along a narrow gauge railway, plus a variety of other engines and a collection of antique printing equipment. The Whipple Museum of the History of Science is also worthy of a visit for its fascinating collections of old scientific artifacts, including instruments and prints dating back as far as the 17th century. Just 13 miles east of Cambridge, Newmarket has been a center of English horse racing since 1174. Horse fans will enjoy visiting the National Horse Racing Museum on the picturesque High Street. Exhibits relate to the history of the "sport of kings," still one of the most popular sports in Britain. The collection includes paintings of famous horses and jockeys, old saddles, tack, and trophies. There are several stables actually in the town, not to mention the famous racecourse and training "gallops" close by. Luxury Hotels: Overlooking a broad park near the River Cam and the colleges, with plenty of restaurants within easy walking distance, the large rooms at The Gonville Hotel are well located for exploring Cambridge. Walk along the Cam and to the historic sites from The Varsity Hotel & Spa, a boutique lodging with a rooftop terrace, near Trinity and Magdalene colleges. The name Hilton Cambridge City Centre says it all, right in the center surrounded by historic colleges, restaurants, and shops. The modern hotel offers free Wi-Fi. Mid-Range Hotels: Regent Hotel rooms overlook a park near the colleges and River Cam or busy Regent Street's shops and restaurants. A two-minute walk from either the Fitzwilliam or Polar museum, Royal Cambridge Hotel occupies a series of 19th-century row houses. The neighboring boutique-style Lensfield is also about halfway between the train station and the city center. Budget Hotels: You can walk through the park to city center colleges from Travelodge Newmarket Road Cambridge, or there's a bus stop right in front; underground parking is free. There's also a bus stop at Ashley Hotel, or you can walk across the river and over Midsummer Common to the center in about 20 minutes. Rooms here have safes, coffee and tea-making, and free Wi-Fi. For lodgings with history, choose a student room with a full English breakfast and Wi-Fi included in Christ's College Cambridge, founded by the mother of Henry VII in 1505 and the college of Charles Darwin.